Does my junior need clubs? Yes. If your child has clubs please bring them to class. We will make sure they are fitted properly. If they don't have clubs we'll let you know our recommendation as well as suggest the best, most cost effective solution and the vendor to purchase them from. If your child does not have clubs please let us know and we will provide them. We have a very limited selection of clubs, however, so it's best if they bring their own. What does my junior need to bring to session? Please have them bring a water bottle, sunblock, proper clothing for the current weather and clubs if they have them. Golf shoes are not necessary, and in fact we prefer flat-soled shoes like tennis shoes when they are putting (it's kinder to the green). What if my junior is in a tournament the day of the session? No problem. Juniors are automatically exempted when they have a tournament. We want to encourage them to play in as many tournaments as possible. All you have to do is drop us a line (ejones@EricJonesGolf.com) and let us know in advance. Please send us an email in advance, otherwise your junior will have an unexcused absence. What if there are holidays? No problem. We don't have sessions on major holidays like Christmas, New Years Day, Easter, Memorial Day, July 4th, Labor Day, and Thanksgiving. When you have a session that falls on a holiday your session is automatically carried forward. You don't "lose" the session. That's one of the great things about our system compared to the normal "monthly" programs. For more info see "How do the Sessions work?" FAQ. Do you go on the golf course to play? Yes, we typically play once a month to ensure that the players are mastering their skills from practice - the truest testing ground for improvement. Do you have an absence policy? Yes. The short answer is that you are allowed to miss one session in twelve (12) weeks. But there are a variety of exceptions. Here's the list of absence types: 1. Unexcused Absence. One absence allowed in twelve weeks. The "allowed" session is carried forward. The following are "Excused" absences. 2. Major Holidays. We don't have sessions on major holidays. No need to let us know you'll be away. Your junior is automatically excused and the session is carried forward. 3. "Closed": There are times - particularly with inclement weather - when we simply cannot practice or get on the course. When we are "closed" your session is automatically carried forward. HOWEVER: We strongly encourage you to check in. Often we turn "rain days" into "movie" days. We watch a golf-related movie and discuss lessons learned and how juniors can apply those lessons to their own game or life situation. Movie days are a lot of fun, and we supply the popcorn. 4. Tournaments: Juniors are automatically exempted when they have a tournament. We want to encourage them to play in as many tournaments as possible. All you have to do is drop us a line (ejones@EricJonesGolf.com) and let us know in advance. Please send us an email in advance, otherwise your junior will have an unexcused absence. How do I sign up my junior? It's simple. You can do it online and with a credit card with a few clicks. 1. On our web site click the "Junior" tab. 2. Click the "Sign Up Now" link. 3. Click the program tab (Big Easy, El Nino, Sharks) appropriate for your junior. *Note: If you are not sure which program to choose, read the "How do I know which Team I should put my junior in?" FAQ 4. Select one of the Teams by using the radio button. Note: The session time and day are shown next to the team name. 5. Select Commitment Package. Review the commitment levels and pricing. We strongly encourage you to consider the 12-month level. It's the best value and the best way for your junior to improve. Click the "Sign Up" button. 6. Click the "Join Today" button (for new members). You'll need to establish your account. Enter the information for the person who will be charged (usually a Parent). 7. Add your Junior. Under the "Who are you registering" box there is a tab called "add a new member to your membership" Please click this tab to register your junior. Put the junior's first and last name in the fields. If they have their own email address and phone you can enter their specifics. Otherwise you can re-enter the parent email and phone number. Click Save. 8. Click the "I agree" under the Terms & Conditions 9. Fill out your card information 10. Click the "Submit Secure Registration" button Note: If someone referred you to our program please enter their name in the "How did you find out about us" box before submitting your registration. Whoever referred you will get a free session (so will you when you refer others to the program). You are all set! See you at the next session! How does the payment/billing process work? Simple. We only take credit/debit cards. When you sign up your card is billed for the first month (4 sessions). Once your four sessions have been used up your card is billed for the next four sessions. Regardless of whether you choose the 3-month or 12-month commitment level, your card is only billed every 5th week (you don't have to pay everything up front). Our secure system remembers your card number, so you don't have to worry about contacting us every month. When your commitment level expires and you've used up all your sessions we'll contact you to arrange for a renewal. How many months should I sign up for? This is a year-round coaching program. We know from personal experience that great golfers develop through consistent effort over a long period of time. We want to encourage you to enroll your junior for the longest time frame possible. That's why we've created different pricing structures: the longer the commitment the lower the cost. We sincerely hope you'll consider the 12-month commitment. That's 48 sessions for the year. How do I know which team I should put my child in? Each team is created based on experience level, skills and goals. In general the Big Easy program is for new golfers, El Nino is for intermediate golfers, and Sharks is for High School, advanced, and tournament players. Think of it like the colored belt system in Karate, except we use hat colors instead of belts, and even within colors there are levels. Here are some rules of thumb: Big Easy 1 is for younger players, roughly aged 6 to 9. Big Easy 2 is for golfers aged 9 to 13. But the key factor is experience level, because the emphasis is different for each level. For new golfers in Big Easy 1 the emphasis is on building solid fundamentals. We focus on GASP (Grip, Alignment, Stance, Posture), making consistent contact, creating a simple routine, and learning the different strokes for putting, chipping, pitching, irons and the driver. Big Easy 2 golfers are expected to know how to grip the club, set up correctly, and hit the ball. 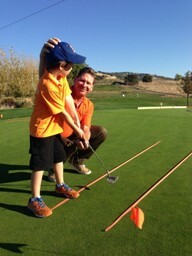 They are still relatively new to golf, but we think of them as advanced beginners. They've mastered the basics, so the emphasis in Big Easy 2 is on leveling-up their basic skills and ball-striking. 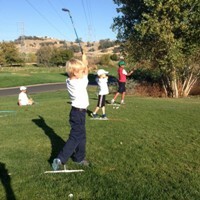 El Nino/La Nina golfers are advanced beginners to intermediate golfers. With these golfers the emphasis is on learning the four critical shot-making skills: Center Contact, Directional Accuracy, Distance Control, and Shape Control. El Ninos also develop their on-course skills: understanding course navigation, managing their game, and making good strategic decisions. They also begin to integrate mental skills such as focus, emotional control, and visualization. Shark levels are for advanced players. The emphasis is on game management and playing well under the pressure of competition. Sharks continue to level-up their ball-striking skills, but also learn much more advanced skills like lob and flop shots, recovery and trouble shots, uneven lies and much more. We place a lot of emphasis on the learning process, mental skills, effective practice habits, and learning how to score. Sharks will make extensive use of our radar training systems to dial in their accuracy and distance control. Click the Sign Up Now! link to get started right away. Skill Development: Learning golf is a gradual process of acquiring and mastering skills. The program focuses on taking juniors through a structured progression, with goals established for each level. That's one of the benefits of a year-round coaching program: consistency. * Big Easy: For new golfers. The age range is typically 6 to 9 years old, with most in the 7-8 range. * El Nino / La Nina: for ages 8 to 13, with most in the 9 to 12 range. Advanced beginners to intermediate levels. To register your junior for a program click the Sign Up Now link. You'll see the various program levels on the next page. Skill Progression: In each coaching session juniors rotate through several stations to work on a variety of skills and shots depending on their current skill level. New golfers will focus on the basics - Grip, Alignment, Stance, Posture (GASP), a basic swing, and making consistent contact with the ball. But as they master the fundamentals their goals become more challenging: learning directional accuracy and hitting to targets, learning to control trajectory and distance, and then learning how to shape shots. FAQs: If you have additional questions we have a wealth of answers on our Frequently Asked Questions page. Let's Have Fun: We are passionate about golf, about teaching, and about having fun. 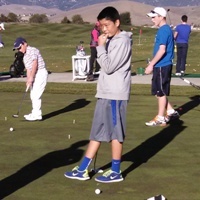 Golf is a journey, and we look forward to helping your junior reach their dreams.